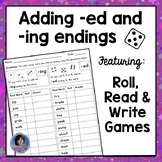 Your kids will have a blast adding onsets to the -ing ending and determining if the word they made was real or nonsense. When they are finished sorting their words they must record their learning on recording sheet provided. 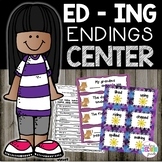 Base Word EndingsSorting CenterCheck out my other $1.00 Centers and Printables:$1.00 Centers and PrintablesPlease note that this center is included in the 2nd Grade Journeys, Lesson 9. So if you have purchased that set or Unit 2, please do not purchase this center. **Directions: Read the sentence. 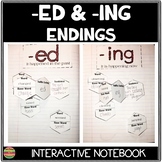 -ing endings - Race to the Finish! Should I just add an -ing? Should I double the letter first? Maybe I need to take the -e off the end. Cut out the words. Decide how to add the ending -ing. Glue the words in the correct column and add the ending. ED or ING Ending. Common Core. 4 pages of 8 questions each page. ED or ING Ending. Common Core. 4 pages of 8 questions each page. This is a great resource to see if you students have mastered determining whether a word should end in ED or ING. 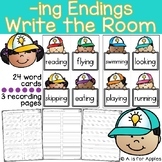 Can be used for classwork, homework, learning centers or for extra support. After doing a lesson on -ed and -ing endings this was a sheet used to practice applying the rule. This was for students who receive phonics instruction in a small group center. 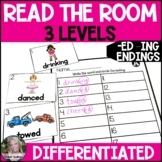 This is a great sort I use with my students to assess their understanding of how add the -ing ending to different verbs. This worksheet can be used for practice/reinforcement or for an assessment after teaching the skill! 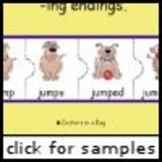 Students will learn how to double the last consonant of a word when adding -ing to certain words. Great for first or second grade students. Added practice and review once the concept has been introduced.